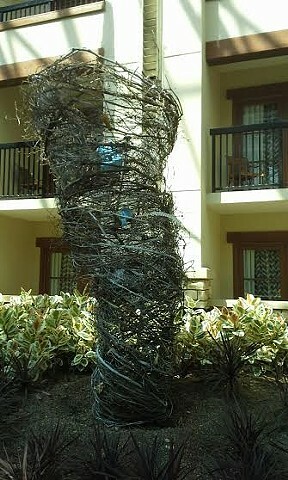 18' tall X width varies 4-7 ft.
SCULPTURE: The GRAPEVINE TORNADO for the GAYLORD HOTEL AND RESORT, for summer OZ event, a site specific installation made of grapevines woven on armature of iron pipe and hog wire with Farm House, Barn, Red Shoes, Picket Fence, Rocking Chair and Dorothy Bed. Actual grapevines were hand gathered in 110 F summer on several occasions and some vines were ordered from a vineyard in Tennessee. IT took about five truckloads and had to be hauled in separate trips i sections, all of which had to be designed for hauling, handling and on site installation.